/ New Toyota Auris. Smartest Hatch in Town? New Toyota Auris. Smartest Hatch in Town? IS THIS THE SMARTEST NEW HATCH IN TOWN…AURIS IT JUST ME? Fact: The C segment comprising compact family hatches (30%) and sedans (70%) is under pressure from compact SUVs. Fact: The Corolla is the dominant player in this segment. Fact: The Auris is a relevant model despite a limited engine repertoire and a plethora of competitors. There are currently 17 hatch ranges – from bread-and-butter to premium – all trying to woo the same customer. Auris achieves a 10% share of the C-segment hatch market which equates to an average of 160 units per month. Fact: The new refreshed Auris launching this month, focuses on sharper design inside and out, enhanced interior quality as well as a more refined, dynamic driving experience that will appeal to customers with both rational and emotional needs. Touted as the smartest hatch on the market, the refreshed 2015 Auris range makes its South African debut this month. Being a Toyota, low running costs and peerless reliability are the cornerstones of this model, but that’s not all the newcomer has to offer. Decidedly piquant exterior styling, coupled with a revamped ‘superfine’ cabin and a driving experience that is palpably more focused than its predecessor, mean that the new Auris is a head-turning car that’s just as comfortable tackling the twisties, as it is taking on the might of the school run. As Glenn Crompton, Vice President of Marketing for Toyota South Africa, points out: “In design and engineering terms, a key priority for the new Auris was to develop a stronger emotional appeal for those who want to feel more connected to their car through the way it looks, the way it feels and, of course, the way it drives. 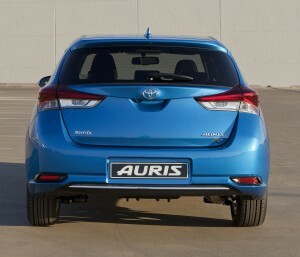 The new Auris gets a comprehensive ‘top ‘n tail’ to give it an arresting look up front as well as a pert new rear end. 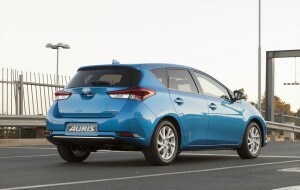 These changes give the Auris a more hunkered down, masculine demeanor. A point of interest is that the Auris is one of the lowest cars in its class. This translates to a low-slung driving position, which makes the driver feel closer and more connected to the road. 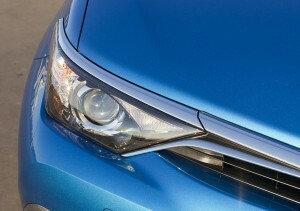 Zooming in on the front design, a pair of chrome ‘wings’ emerges from a new, more prominent Toyota emblem set in a thinner upper grille. These ‘wings’ underscore the front lip of the bonnet, running the full width of the car and encapsulating the crisply angled inside edge of the sharp-eyed headlamp clusters. 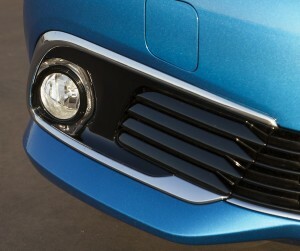 The lower grille, set beneath a more prominent front bumper, now runs the full width of the car. It has a narrow centre section, framed by a chrome accent strip which widens into deep pods housing integrated fog lights (from Xs model upwards), at the furthest edges of the new design. In profile the new front and rear styling generate longer overhangs, improving the overall balance of the design and leading the eye in a sweeping line from the front Toyota emblem to the rear lamp cluster. A new shark fin roof antenna and turbine-inspired 16-inch alloy wheel designs add further impact. To the rear, the lower half of the car has been completely redesigned, again to add visual emphasis to the vehicle’s broad stance. The width of the deeper, more muscular bumper design is amplified by the location of reflector housings at the furthest edges and by a thin chrome trim line. The rear lamp clusters have also been redesigned, giving Auris its own, distinctive lighting signature. From Xs model grades upwards, the exterior grille and bumper finishes get an extra flourish courtesy of glossy piano black finishes and chrome trim. Two new exterior colours have been added – Citrus Metallic (a chartreuse hue) and Blue Metallic (royal blue in intensity). On board, the sensory quality of the cabin has been significantly raised with a redesigned more curvaceous dashboard boasting soft-touch quality trims and surface finishes as well as a new central, tablet-inspired audio visual display panel which comes standard on all models from the Xs grade upwards. 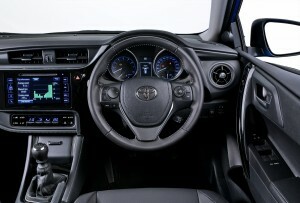 Featuring electrostatic (touch-sensitive) switchgear - a first in terms of technology advancement for Toyota - the touch screen panel offers CD/DVD, Radio (FM/AM) and Bluetooth/AUX/USB functionality as well as a host of other on-board functions including a reverse camera with guide lines. The driver’s instrument binnacle has a stronger, more sporting design with tubed tachometer and speedometer dials either side of a new 4.2-inch colour TFT multi-information screen (Xr models only). In addition, many details, such as the air vents, door handles and gear lever surround, have been reworked to give a crisper, high-quality appearance. The shape and finish of chrome trim features have been harmonised and a new set of upholstery designs, including leather for the Xr, complete the more premium quality cabin environment. The new Auris range benefits from further suspension and steering revisions designed to improve ride comfort and handling. Components in the MacPherson strut front suspension have been revised, including the design of the coil springs, shock absorbers, upper insulators, bound stoppers and stabiliser bushes. In combination, the changes to the suspension improve initial roll damping, minimise friction and amplify straight-line ride comfort. In addition, the electric power steering system’s mapping has been tuned to further build steering weight as vehicle speed rises, giving better feedback between 60 and 80km/h. Soundproofing has been improved by adding additional sound-absorbing materials in strategic locations around the instrument panel and transmission tunnel. An outer tunnel silencer has been added to minimise transmission noise. Additional sealing in the front wing, dashboard and door area further cuts the amount of engine, road and wind noise reaching the cabin. · 1.3-litre petrol unit producing 73kW at 6000rpm and 128Nm of torque at 3800rpm and propelling the Auris 1.3 from 0-100km/h in 12,6 seconds and on to a maximum speed of 175km/h. Fuel consumption is pegged at 5,8l /100km for the combined cycle. · 1.6-litre petrol unit producing 97kW at 6400rpm and 160Nm of torque at 4400rpm and dispatching the 0-100k/h sprint in 10 seconds. Top speed is clocked at 200km/h. The 1.6 manual consumes an average of 6,2l /100km in the combined cycle; the 1.6 CVT is even more economical, averaging just 6,0l / 100km. · 1.8 Hybrid – this model also receives a make-over for 2015. Details will be disclosed closer to launch at the beginning of September 2015. 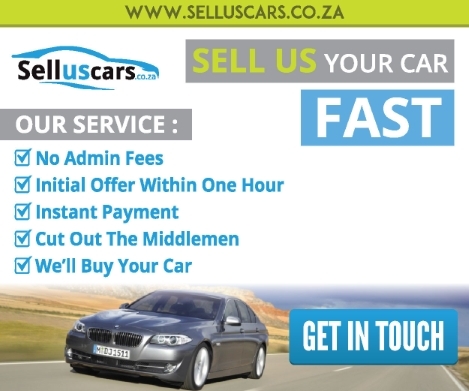 · Entry-grade models (X and Xi) are available on 1.3 and 1.6-litre engines. Bluetooth has been added to this spec level. Other spec highlights include Follow-me-home headlights, shark fin antenna, leather gear lever and steering wheel, electric power steering, air conditioner, dual front and side airbags, remote central locking, ABS with Brake Assist and Electronic Brake Force Distribution (EBD),seatbelt warning for all occupants, RDS audio four-speaker system, electric windows with Driver One-Touch and steering switches. The X model is shod with 15-inch steel wheels; the Xi model is equipped with 16-inch alloys. The Mid-grade model (Xs) is only available on the 1.6-litre engine. This variant is now also equipped with the all-new display audio featuring electrostatic switchgear. Over and above the entry grade models, Xs also features front fog lamps, piano black gloss finish for the grille and rear bumper with chrome trim accents, reverse camera with guidelines, six-speaker sound system, vanity mirror lamps and Sport fabric upholstery. The High grade models (Xr) are available on the 1.6 manual and CVT as well as the Hybrid Derivative. This model comes with full-house spec including niceties such as auto lights, electrochromatic rearview mirror, colour TFT multi-information display, cruise control, smart entry and push start technology, electronic dual-zone climate control, curtain airbags and a driver’s kneebag, full leather upholstery with seat heaters for the front seats and electric lumbar support for the driver. The new Auris benefits from a three-year/100 000 km warranty. All Auris models come standard with a five-year/ 90 000 km service plan. The new models are also supported by the ToyotaCare Roadside Assistance Programme which entitles customers to 24-hour roadside assistance, ensuring ultimate peace-of-mind motoring.